Now that day was a Sabbath. So the Jews said to the man who was cured, "It is the Sabbath, and it is not lawful for you to carry your mat." He answered them, "The man who made me well told me, 'Take up your mat and walk.'" They asked him, "Who is the man who told you, 'Take it up and walk?'" The man who was healed did not know who it was, for Jesus had slipped away, since there was a crowd there. After this Jesus found him in the temple area and said to him, "Look, you are well; do not sin any more, so that nothing worse may happen to you." The man went and told the Jews that Jesus was the one who had made him well. Therefore, the Jews began to persecute Jesus because he did this on a Sabbath. The Gospel for today is one of Jesus’ healing miracle stories in John. And this time it is someone who has been ill for 38 years. However it is quiet odd to note that the person, who has been ill there for a long time, had never been place into the pool. Historically speaking, during those times, such pools really existed. 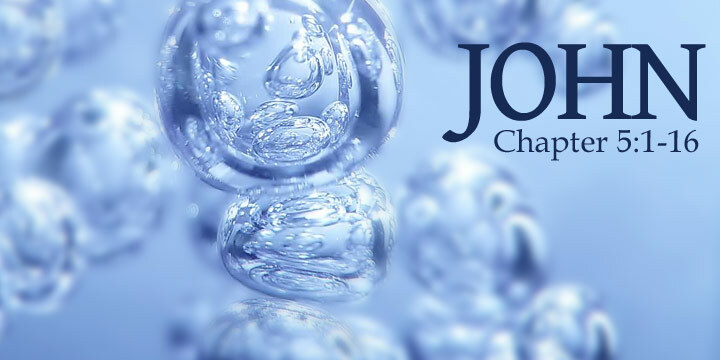 And the Jews believe that when the water is troubled -- meaning some bubbles come out which signifies that it may have been a spring -- there would be healing that would happen. It is like some of our pilgrim places where we believe that healing can take place by going there or bathe into the water. Hence, the ill man wasn’t able to go to the pool because perhaps it takes timing to wait and go into the pool until the bubbles will come. And sadly also it was hard for the man because no one brings him there when it happens. But the ill man’s patience paid off. Jesus came along and this time the ill man didn’t ask for healing from Jesus, which is the usual structure of a healing story, but instead Jesus himself initiated by asking “Do you want to be well?” and commands the ill man "Rise, take up your mat, and walk." And immediately the man became well. Eventhough the man is not a believer of Jesus and yet he has been praying so hard for healing to happen, Jesus knew what is in his heart. Hence, Jesus granted his desire even he does not know who Jesus is. Some scholars read this Gospel passage as something ecumenical, that the power of God is ever power and encompassing. Yet for us Christians it only shows that God answers our deepest prayers and knows our needs. However as we know not all prayers are answered. That is why the line, “Do you want to be well,” gives us a very important clue how God answers our prayers. God answers our prayers when we truly desire for it and when it is in tune with the desire of God. 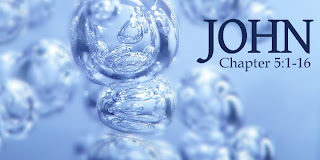 Since the Gospel of John is full of symbolism and meaning, there is another part of the story. Jesus performed the healing during Sabbath. And Sabbath for the pious Jews was a holy day and no such work is allowed – like picking grains or cleaning the house, not even performing miracles and healings. But with an outsider’s point of view, we understand that Jesus did not violate any law because he was addressing a need. The law of Jesus is the law of love. Hence whatever that entails love, we must follow it. But in John this is not emphasized. What is emphasized is that Jesus was putting himself into trouble. This brought controversy and conflict because Jesus is against the Jewish authority. And for us Catholics during this season of Lent, it brings about the mystery of the passion and death of Jesus. Why must he get into trouble that the Jewish authorities persecute him? Did he done something wrong? The answer is a mystery since we can’t capture and contain this love of God for us that is manifested through the life and work of Jesus. Yet these are the questions that we should ask ourselves as we come close to Holy Week. And also feel the feelings of confusion and shame that is being evoked from such stories. And hopefully through these, we can find our own personal answers as we journey with Jesus through his passion and death. May we realize that Jesus humbled himself and faced all these pain and suffering for us because he loves us. Peter approached Jesus and asked him, "Lord, if my brother sins against me, how often must I forgive him? As many as seven times?" 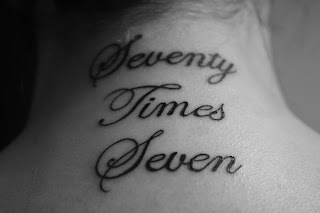 Jesus answered, "I say to you, not seven times but seventy-seven times. That is why the Kingdom of heaven may be likened to a king who decided to settle accounts with his servants. When he began the accounting, a debtor was brought before him who owed him a huge amount. Since he had no way of paying it back, his master ordered him to be sold, along with his wife, his children, and all his property, in payment of the debt. At that, the servant fell down, did him homage, and said, 'Be patient with me, and I will pay you back in full.' Moved with compassion the master of that servant let him go and forgave him the loan. When that servant had left, he found one of his fellow servants who owed him a much smaller amount. He seized him and started to choke him, demanding, 'Pay back what you owe.' Falling to his knees, his fellow servant begged him, 'Be patient with me, and I will pay you back.' But he refused. Instead, he had him put in prison until he paid back the debt. Now when his fellow servants saw what had happened, they were deeply disturbed, and went to their master and reported the whole affair. His master summoned him and said to him, 'You wicked servant! I forgave you your entire debt because you begged me to. Should you not have had pity on your fellow servant, as I had pity on you?' Then in anger his master handed him over to the torturers until he should pay back the whole debt. So will my heavenly Father do to you, unless each of you forgives your brother from your heart." The Gospel for today speaks about forgiveness. Peter asked Jesus, "Lord, if my brother sins against me, how often must I forgive him?” Jesus answered him with a figure, "I say to you, not seven times but seventy-seven times.” This figure doesn’t indicate to us that we should only forgive 539 times. No. That is not the point Jesus is making. Jesus emphasizes that when we forgive, we don’t count, but we forgive with our whole heart. Hence, this parable of the unforgiving servant emphasizes this very important Christian quality which Jesus invites us to do to others especially those who have wronged, hurt, or indebted to us. When I was working in the New Bilibid Prisons as a rehabilitation officer, one of my main tasks was to help bridge or reunite my inmate-clients with their families as part of the transition for their release. So I go to the houses of my inmate-clients and assist in the reconciliation phase between the inmate and their families. Many families would open their doors to me and it brings me such joy to see families being united again with my inmate-clients. However, there are also families who would send me away and they do not want their father, brother, or son to go back again into their lives. And mind you it is so hard to be a bearer of such news to the inmates. And this saddens me that even their own family, it is hard to forgive. It even pains me because I witness how my inmate-clients have tried so hard to make that promise of a renewed and better life outside with their families. On the other hand, I could imagine how hard it must be also for the families to simply forgive their father, brother or son who have committed a crime and caused so much pain and burden for them. In short, it is really hard to forgive. So who could blame them, right? Yet what I have learned from this experience is that forgiving is a process, even a very long process that could take up years or even a lifetime. And forgiveness will take place when one opens his heart, even how small the opening is. As long as your heart is open for reconciliation, forgiveness takes place. And Jesus gave us a hint on how we should forgive through the parable. When somebody asked for our forgiveness, we should remember our experiences when we were also forgiven by our family or friends. We should forgive others as we were also forgiven. And most of all, we must remember the one who truly forgives us – Our Father. As the Father has forgiven us, loves us, so too we must try our very best to forgive and love others. Jesus said to the Pharisees: "There was a rich man who dressed in purple garments and fine linen and dined sumptuously each day. And lying at his door was a poor man named Lazarus, covered with sores, who would gladly have eaten his fill of the scraps that fell from the rich man's table. Dogs even used to come and lick his sores. When the poor man died, he was carried away by angels to the bosom of Abraham. The rich man also died and was buried, and from the netherworld, where he was in torment, he raised his eyes and saw Abraham far off and Lazarus at his side. And he cried out, 'Father Abraham, have pity on me. Send Lazarus to dip the tip of his finger in water and cool my tongue, for I am suffering torment in these flames.' Abraham replied, 'My child, remember that you received what was good during your lifetime while Lazarus likewise received what was bad; but now he is comforted here, whereas you are tormented. Moreover, between us and you a great chasm is established to prevent anyone from crossing who might wish to go from our side to yours or from your side to ours.' He said, 'Then I beg you, father, send him to my father's house, for I have five brothers, so that he may warn them, lest they too come to this place of torment.' But Abraham replied, 'They have Moses and the prophets. Let them listen to them.' He said, 'Oh no, father Abraham, but if someone from the dead goes to them, they will repent.' Then Abraham said, 'If they will not listen to Moses and the prophets, neither will they be persuaded if someone should rise from the dead.'" In the Gospel for today, we can see the story of about the rich man and Lazarus. There is the great divide between rich and poor which is clearly illustrated in the gospel. The rich man feasted lavishly every day. On his gate lays a poor man named Lazarus who was full with sores, who was content on eating whatever crumbs that fell from the rich man’s table. After a period of time both the rich man and Lazarus died and ironically there was a reversal of fortunes. Lazarus was carried by angels to be with Abraham while the rich man went to the netherworld. Jesus told the parable of the rich man and Lazarus to a group of money-loving religious leaders who believed that they too could be close to God while ignoring the poor at the gate. In fact, they most probably believed that their wealth was a sign of God’s favor, while poverty was a sign of God’s curse. The story about the rich man and Lazarus sounds very familiar to us isn’t it? Perhaps we have seen this same scenario in our parish Church where the beggars are waiting outside for us the parishioners to come out after mass; or some poor kids knocking on our car doors at the stop light; or a woman carrying a child at a nearby mall patiently waiting for the sound of coins falling inside an empty can. 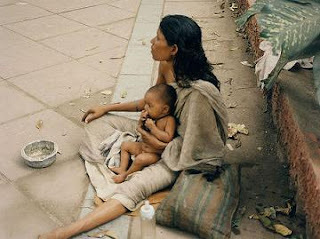 There are many poor people everywhere. The poor are still at our gates. Though the Gospel sounds like a direct warning for those who are rich and who doesn’t know how to share their wealth, Jesus invites us to take our part in helping the poor. Being rich is not bad. Many rich people earn their living in an honesty and hard work. It becomes our failing when we are so enamoured with our money that it becomes our master! We must learn to share our blessings to others. However, the problem of poverty in our country is so complicated and complex. It takes good services and programs from both the government and civil society. But despite of this, Jesus’ message is clear. We must do our share. As Jesus ministered among the poor, and so should we. And this is not always easy. Working with the poor can be a threatening experience. Sometimes, the poor are not easy to deal with. But somehow, in the power of God’s Spirit, it is possible to overcome our fears. There are many ways of helping the poor and not only through “dole-outs.” We empower them in our unique way so that they may have hope and learn to stand on their own. During this Lenten season, we are encouraged to do prayers, fasting, penance, and to give alms to the poor. The poor is always part of our Christian life. Jesus himself always ministered to the poor and sick. May we always learn to give and make sacrifices for the sake of our poor brothers and sisters. As the Beatitudes say, “Blessed are the poor for theirs is the Kingdom of Heaven.” It is through giving our hearts to the poor that we may enter truly the “gate” of Kingdom of God. 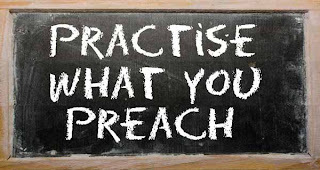 In the Gospel for today, Jesus was preaching to his disciples about being true to what you preach. 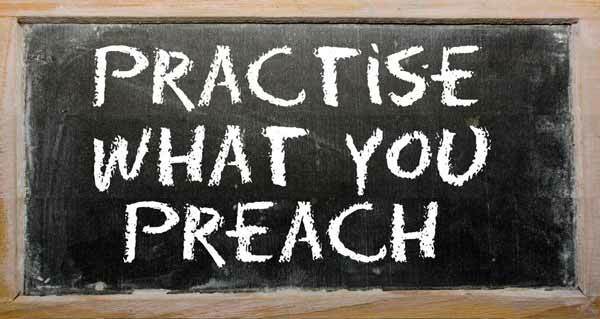 You can’t preach something that you yourself do not practice. Let me tell you two stories. The first story is about a boy I have heard from a parent in our Jesuit parish in Iloilo. The other story is about someone whom I consider as a true saint. First story. There was a little boy who attended a mass with his grandfather. The church they were going to had beautiful stained-glass windows. The grandpa told his grandson that the windows contained pictures of Saints Matthew, Mark, Luke, John, Paul, and many other saints. When he got home, the boy told this to his mom and dad. The father, wanting to be funny and curious about what his son had learned, asked, "What is a saint?" The boy thought for a minute and then replied, "A saint is somebody the light shines through." When I heard about that story, I realized that it was a pretty good definition of a Saint. Who are your saints? Who are the people in your life who let the light of God shine through them for you to see? This brings me to my second story. There was a quiet and pious church worker, again in one of our Jesuit parish in Iloilo that I always admire. Her name is Grace. Grace was very active in many of the parish activities but I think her greatest act of stewardship, service and sacrifice were her birthday and anniversary cards. This was Grace's love and passion. Usually we printed a list of the birthdays and anniversaries of our parish workers in our newsletter. Grace would send everyone a birthday or anniversary card. We usually tried to help her by giving her boxes of generic cards that were donated but Grace wouldn't take them. Grace delighted in going to the card shop and selecting cards just for each person. She prayed for them while she was selecting them and while she was filling them out. Because of this, Grace had a huge impact on the life of our parish. When Grace died, they found her, lying in bed. Her Bible was open and laying on the bed next to her. And her hands were folded in prayer. When her children came, they found three months’ worth of birthday cards. The cards were already addressed, signed and dated. You see, Grace would pencil in the date that the card needed to be mailed under where the stamp would go, so that everyone would get their card on or before their birthday. She was doing a very simple task, yet Grace did it faithfully and lovingly. Grace is indeed a saint in my book. So what made Grace so special? Grace did what the Pharisees in this passage didn't do. Although she was one, Grace never thought of herself as a Saint. She only thought of herself as a steward and a servant. Grace let the light of God shine through her. And when she did, lives were influenced and changed. This Lenten season, may we be a light to others by practicing what we preach. Always practice what you preach and truly the light of Christ shines brightly to others. “Ask and it will be given to you; seek and you will find; knock and the door will be opened to you. For everyone who asks, receives; and the one who seeks, finds; and to the one who knocks, the door will be opened. Which one of you would hand his son a stone when he asks for a loaf of bread, or a snake when he asks for a fish? If you then, who are wicked, know how to give good gifts to your children, how much more will your heavenly Father give good things to those who ask him. “Do to others whatever you would have them do to you. This is the law and the prophets. or mother. Our Gospel for today is the continuation of the Sermon on the Mount. In the Sermon on the Mount, Jesus warned his disciples against formal, hypocritical prayer, and thus he gave them a model prayer to start them on their prayer journey. Now he takes the lesson a step further by teaching them to ask in faith. The teaching seems to be simple -- and at one level it is. Jesus introduces three words that indicate desire in our prayer: ask, seek, and knock. Ask seems to refer to simple petition, with the promise "it will be given to you." 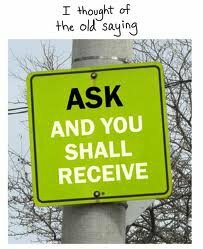 It is to ask for, with a claim on receipt of an answer, ask, ask for, demand." Many of our prayers are of this kind. Finding that parents are the key to getting many things, our children commonly ask for what they want: "Mom, can I have some cookies." Or "Dad, can I drive the car tonight?" And the answer, though, is not so simple. It could be, "Yes, I'll bring some to you on a plate." Or, "No, they'll spoil your dinner." Or, "Not now, but after you finish your math homework you can take a break and have three cookies -- no more." One of the lessons Jesus is teaching us is to ask for the things we desire, rather than just trying to seize them on our own. One thing we eventually learn as children is that for some things the answer is always, "No." We learn not to ask any further. We also learn that in some areas if we ask, and conditions are right, we will receive. As we listen to our parents, we are educated in what to ask for and how to ask. We don't learn these things by never asking. We learn by continuing to ask, and gradually learning our parents' mind, and asking according to what we perceive to be their mind. Hence, we are told to ask. "Ask" indicates a petition. "Seek," however, indicates a search for something that is either lost or has not yet been found or discovered. "Seek, and you will find," Jesus says. Just previously in the Sermon on the Mount, he had instructed his disciples, "Seek first the kingdom of God and his righteousness, and all these things will be given to you as well" (6:33). It is as if Jesus calls his disciples to a Quest for a kingdom and righteousness that are not immediately obvious. Seeking can be frustrating, but we must not give up. Jesus has told us to seek his kingdom and his righteousness. The seeking process is a maturing process, a sifting process, and -- if we continue and don't give up -- becomes a single-minded Quest to know God. "Seek, and you will find." There is a promise here that if we will seek to know the Lord, and seek after his presence and blessing, we will find it. There is a looking that can be frustrating, but we are not to give up because we will find Him if we seek him with all our heart. The third command is "Knock, and the door will be opened to you." Basically, knocking is confined to closed doors, not open ones. You've faced closed doors in your life, ones you sought desperately to open or reopen. Some of them you have banged on again and again. But then you learn to try other doors to see which one God will open. "Knock," says Jesus, "and the door will be opened to you." We are to continue to knock on doors until God opens to us the opportunity he has in mind. Today’s Gospel is about prayer. I will not use the passage from Matthew 6:7-15 for our reflection, but instead I will a similar passage from Mark 1:12-15 which also speaks about prayer. This Gospel is simple yet portrays a very good message for all us during this season of Lent. In this part of Mark, Jesus went to the desert for forty days and somehow he faced dangers like the temptation of Satan and presence of wild beasts. However there is also the good presence of angels who administered him. This is what Jesus did before he started his public ministry. “This is the time of fulfilment: The Kingdom of God is at hand. Repent, and believe in the Gospel.” Unlike in the Gospel of Matthew and Luke (both in chapters 4) where the parallel story for this one is more detailed, Mark seems to be the main source for both Matthew and Luke. Perhaps you may ask why did Jesus go to the desert before starting his ministry? Is it a sort of “training” before facing the different challenges ahead? If so, why does he need it since he is the Son of God and he can face any tests and challenges with ease? There are two ways to answer these questions. There is the symbolic way and the pastoral way. The passage, especially in Matthew and Luke, is very symbolic. It reveals to us many truths about Jesus, the reality of evil, the Kingdom of God, etc. But I will not dwell into that. I like to dwell more on what this Gospel means to us today especially as we are in the season of Lenten. Jesus is fully divine and fully human. Though he can face these challenges as a divine person, yet because he is also human, he perhaps encountered difficulty and was even tempted. However I think the important thing here is that Jesus still went to the desert, faced these challenges and temptations. Though we really don’t know what really happened at the desert, yet for sure he was able to gather spiritual strength so that as he started his public ministry, he was filled with life and grace. This is the message of the Gospel for us. In these days of prayer and fasting, we are also invited to go into our own “deserts” and face the challenges and temptations. Why “desert?” Why not a Church or a garden? The desert I am referring to is not really a physical place. 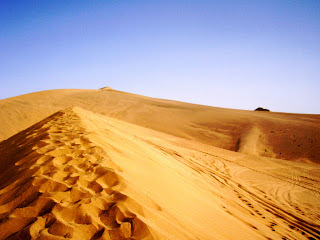 The desert I am referring to is a figurative place that we go when we pray and try to encounter ourselves and our God. The image of the desert can be a barren, dry and empty place. Yet it can be a very powerful and holy place to encounter one’s self and God. When you pray or quiet yourself, try to imagine you are in place where there is nothing. There are no comforts of home, no television, no movies, no phones, no iPods, no computers, no internet, no Facebook, no friends, no family, except your very own self. Try to imagine that. It’s hard right? I know someone who can’t survive without her phone even for five minutes. And yet when we are in our deserts, we have no distractions and we can focus fully in ourselves and to God. Sometimes we may encounter our broken and wounded self, that’s fine. Sometimes it is just empty and quiet, that’s fine. It’s all in the process. Jesus himself went to the desert and faced all of these, not because he has to, but because he really wanted to face himself and God. Hence, when you pray, especially this Lent, you must create your own deserts so that you may be able to really self-examine and mortify yourself. When you do this, you are ready to face the noisy “marketplaces” in your lives. This Gospel passage is very timely since we are in the Lenten season. Lent is 40 days before Easter Sunday. Eventhough we have already started Lent since Ash Wednesday, it is not late to enter into the desert and journey with Jesus, so that our lives may be a true witnessing to his passion and glory; a dying from ourselves to a new life with God. May you find inner peace, hope, healing and a more truthful perspective of life during this Lent.